Bath time with baby is fun isn't it? Both of my kids have been big bath fans...splashing around, having fun, getting clean (okay, perhaps not the getting cleaned part). But do you ever take a look at yourself afterwards and find yourself wondering who got the most water on them- baby or mommy? I find myself in this situation after each and every bath. Couldn't there be a product out there that could make bathtime a little easier and dryer for parents? Fellow mom Amanda West thought the same way, and decided to do something about it and created the innovative baby must have- KozyBaby. 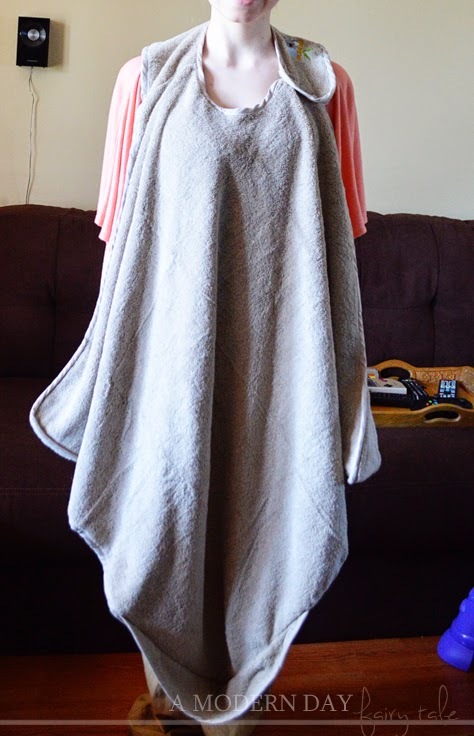 KozyBaby is a genius combination of apron for mom and hooded towel for baby. 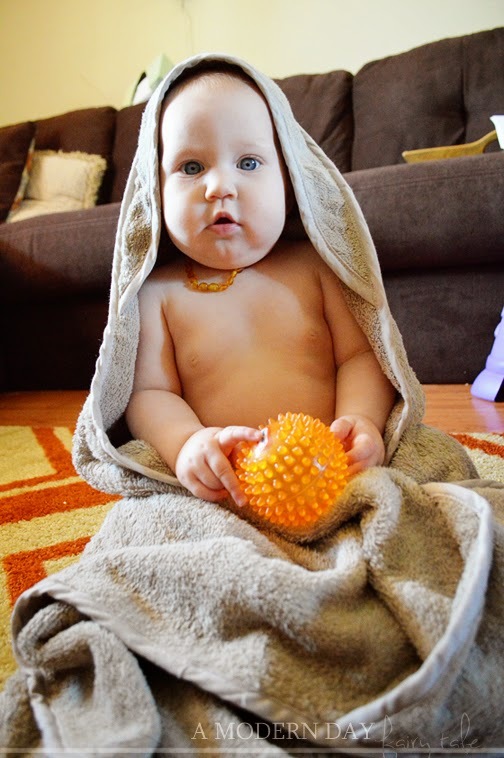 It snaps around mom (or dad's) neck at bath time, so when baby splashes, you stay dry! And when it's time to get out, there's no fiddling around with a squirmy wet baby and pesky towel, you can simply wrap baby up right in your arms. Sounds genius, right? But how well does it work? In my experience- wonderfully! Unlike a typical baby towel, it is super thick and absorbent, so it truly does help keep the wearer from getting too wet, but still soft for baby too. It's large enough to provide plenty of protection and making it ideal for bigger babies too. When bath time is over, convenient hand pockets make it easy to wrap baby in a big squeeze to cuddle them dry! It can even be used as a hooded towel for bigger kids too. 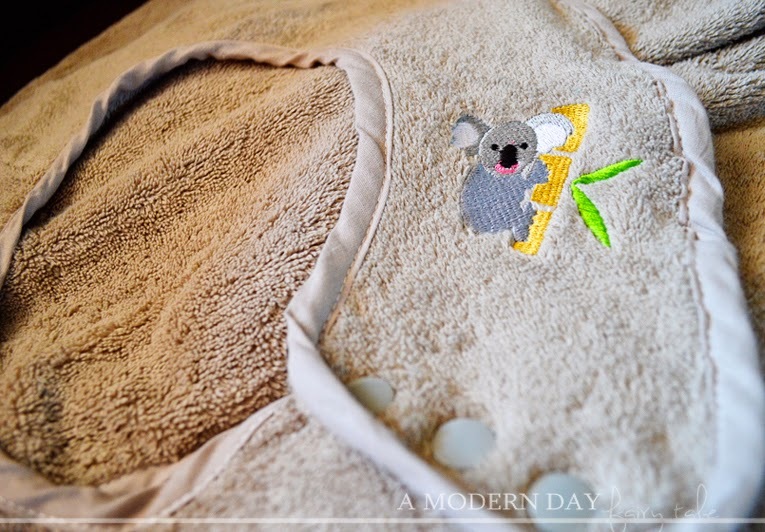 The adorable koala design is fun and perfectly gender neutral. Personally, I would love to see more color options as well, but still I have no complaints! Overall, I loved the KozyBaby. Aside from being a great product, I also love supporting mom created companies. Really, who knows better what a mom needs (or at least what could make her life a whole lot easier and her clothes a whole lot dryer) than someone who has been there herself. That is such a nifty product! I never would have thought of that!